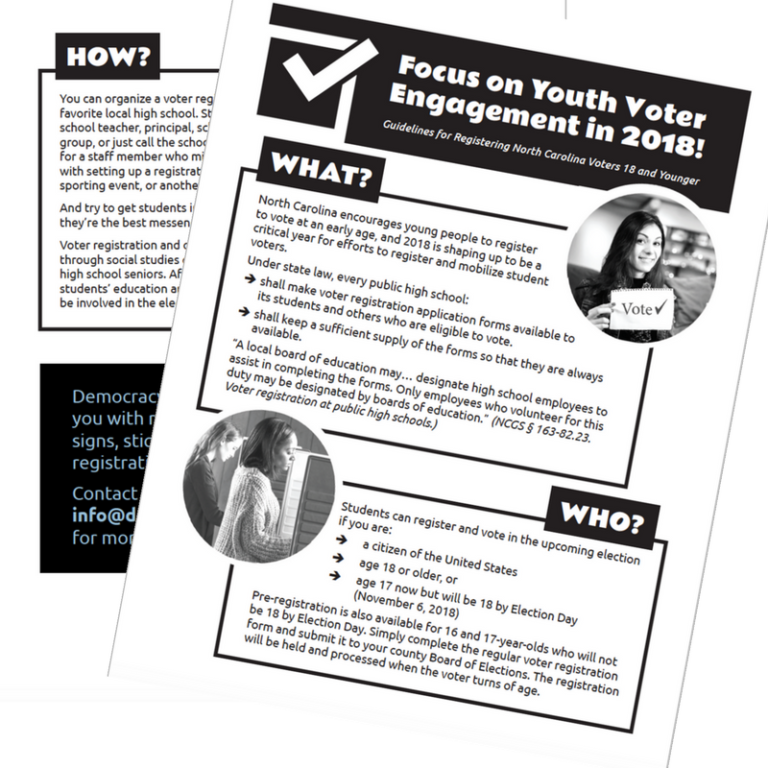 North Carolina encourages young people to register to vote at an early age, and 2018 is shaping up to be a critical year for efforts to register and mobilize student voters. shall make voter registration application forms available to its students and others who are eligible to vote. shall keep a sufficient supply of the forms so that they are always available. Help the young voters in your life get registered to cast a ballot in North Carolina! Pre-registration is also available for 16 and 17-year-olds who will not be 18 by Election Day. Simply complete the regular voter registration form and submit it to your county Board of Elections. The registration will be held and processed when the voter turns of age. You can organize a voter registration campaign in your favorite local high school. Start by contacting a high school teacher, principal, school administrator, student group, or just call the school’s main offi ce and ask for a staff member who might be interested in helping with setting up a registration table in the lunch room, at a sporting event, or another school function. And try to get students involved in asking each other to register; they’re the best messengers! Voter registration and civic engagement may also be emphasized through social studies class discussions or during homeroom period for high school seniors. After all, elected leaders make decisions that affect students’ education and their communities, so it’s vital for students to be involved in the electoral process all along the way! Democracy North Carolina can supply you with registration forms, signs, stickers, and other voter registration supplies. Contact us at 919-286-6000 or info@democracync.org for more information.